A pleasant surprise to find this lil’ album, The Rookery, in the mail box. 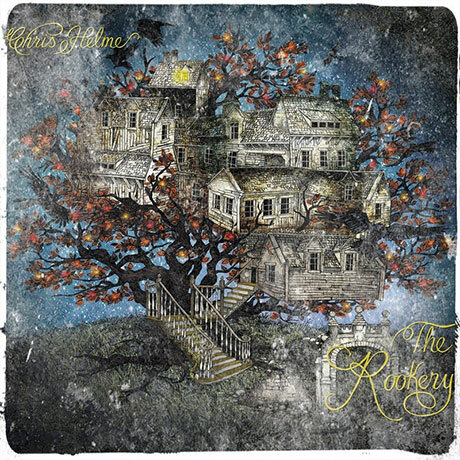 The intricate, dreamlike front cover is tantalising (and quite beautiful) and the name Chris Helme ringed a bell. Two possible options: use a search engine and find out about the musician or just let the music speak for him. Latter sounds more unbiased. Two folky songs after, and it feels like The Rookery is grasping the soil with all fours. The sounds of the mundane and the lay of the line. No mythical sights on this trip. But then the foundations laid by ‘Pickled Ginger’ and ‘Longway round’ till the atmosphere, yielding a country-tinged ditty (‘Darkest Days’ – a fine lamentation) and a SloCore/Country mix called ‘Plane’ (this is a genre revisited in ‘Summer Girl’ and the gorgeous ‘Set in stone’). The earthly sounds are no longer looking at the ground, they are starting to peer through the canopy. We then have lift off. ‘The spindle and the cauldron’ is when it this album peaks in one fell swoop. The stomping rhythm, the heavy, unsettling atmosphere (what’s that noise in the back? It’s both haunting and relaxing)… imagine a dream sequence set in the desert, where mirages play with the fool trying to conquer the unforgiving wasteland. This is the soundtrack for said dream sequence. Fantastic track. This doesn’t mean that Chris Helme was the proverbial donkey that played the flute (sorry, that saying works better in Spanish and I can’t find an equivalent). There’s more songs to enjoy in The Rookery, they are just not as menacing as ‘The Spindle and The Cauldron’. ‘Blindeye’ is a gorgeous triple serving of chamber pop: utterly charming and well-dressed, with a slow dance rhythm that’s just so good. ‘Pleased’ goes for some seedy sounds (proper blues, again, let’s drive through the desert listening to this), ‘Daddies farm’ is a rockier side and feels a bit out of place (good song, though). The Rookery goes for a more introspective ending, slowly decimating the wattage of the amps and instruments track by track until the very dreamy ending (‘Good to be in love’), a tender Chamber Pop lullaby. After listening to this album, I did search engine-ed Chris Helme. Whatever past endeavour he’s done, I think he’s found a good signature sound in The Rookery. Check it out if you want a good mix of country with bits of folk and some orchestral layers of dreamy sounds. Chris Helme Website. Facebook. Twitter. Posted in Alt country, Chamber Pop, Classy, Folk, reviewsTagged Alt country, Autumnal music, Chamber Pop, Chris Helme, dreamy, Folk, The RookeryBookmark the permalink.